Berlioz's "Symphonie fantastique" was first performed December 5, 1830 in Paris. This 1846 engraving suggests a German audience's reaction. What's the most remarkable thing you've done for passion? 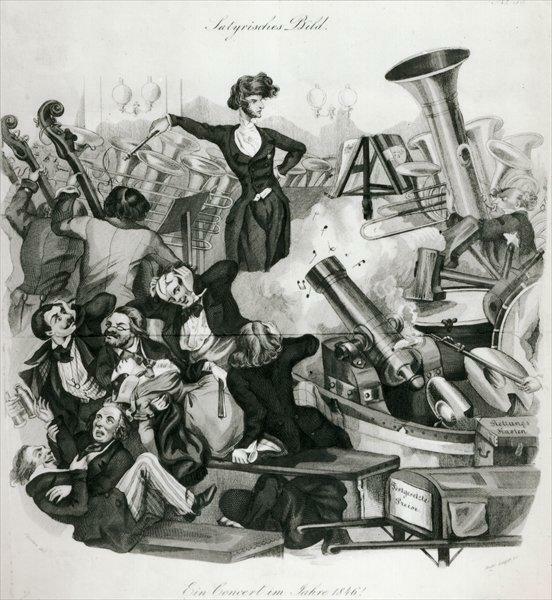 Composer Hector Berlioz was "hardly able to breathe" when he saw the actress Harriet Smithson on a Paris stage in 1827. But his love was unrequited and turned to disgust when he heard scandalous rumors about her. The experience was the inspiration for his Symphonie fantastique, which Harvard scholar Thomas Forrest Kelly calls "the opening salvo" of the Romantic era. Wednesday, Kelly joins Doug to talk about Berlioz's passion, his music and the movement he helped to create.